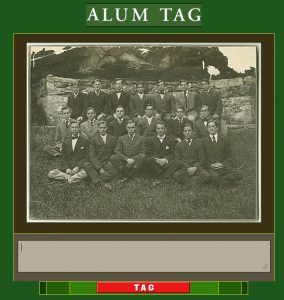 Tiltfactor Laboratory and the Rauner Special Collections Library at Dartmouth College are releasing “Alum Tag,” an online casual game designed to add metadata to a large collection of photographs donated by Dartmouth alumni to the college’s archives. The game involves players earning points by tagging photographs with key words. The system then weighs the tags using frequencies and other statistical measures; those that are considered “valid” are associated with the corresponding photograph and stored, essentially creating data about the images. The game demonstrates the flexibility of “Metadata Games — An Open Source Electronic Game for Archival Data Systems”, a larger pilot project. Professor Mary Flanagan, director of Tiltfactor, was awarded a startup grant from the National Endowment for the Humanities (NEH) Office of Digital Humanities, and from the American Council of Learned Societies, for the pilot. The software itself was created with partner Furtherfield, a UK –based non-profit arts organization that aims to create “spaces for appreciating and participating in practices in art, technology and social change”.